We've been DIY renovating and I knew I needed a hand-vac. I've had mixed experiences with them, but this one seemed pretty strong and appropriate for our wood and tile floors. 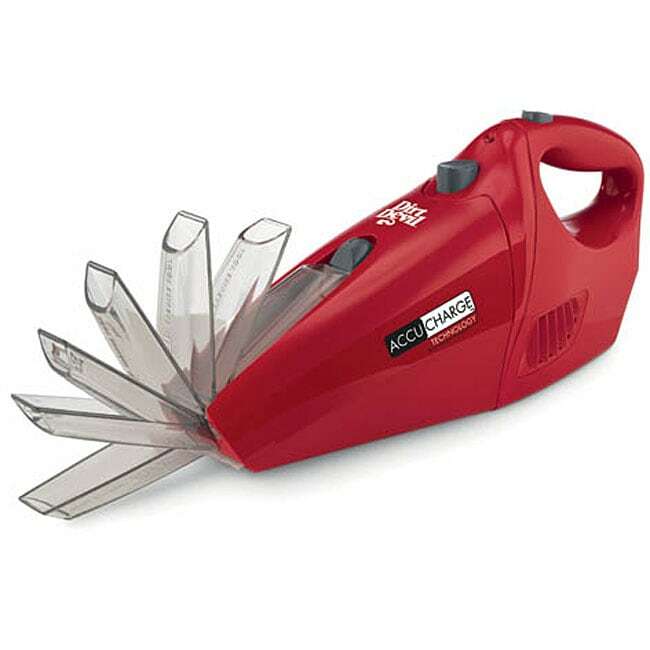 It's quite powerful and the battery lasts a decent amount of time- enough for the quick messes you usually would use hand vacs for, certainly, and I've used it to clean every space between freshly-laid mosaic tile in the bathroom before grouting, which was probably a 7-10 minute process. The battery lasted for the whole process and it picked up all the little bits and pieces down between the tiles with the assistance of the skinny nozzle attachment. I also like how the attachments are attached at all times- you just flip a switch or press a button and they're ready to go. My only slight issue with this device is that the 'release' button for emptying is very close to the 'on' button- no mishaps yet, but there have been some close calls! There are a couple of design flaws. One is the fold out cleaning nozzle. It is very difficult to turn around and lock into place. And you can't leave it locked in place because then it won't fit on the charger. When I try to unflip the nozzle the whole thing comes apart and spills all the dirl I just vacuumed up. Basically it works but getting it set up to use is a pain. If you are like me when you grab your hand held vacuum you are in a hurry to clean up a mess so it's not fun to have to struggle with it first. You don't have to flip out the nozzle to use but it really helps to get detailed cleaning in crevices and to not have to bend down so far. I haven't had it long enough to tell how long it holds a charge or how well it really picks up. It seems to pick up ok but I haven't cleaned the car - a true test. I bought this for light clean-up around the house and the car. Suction isn't that great, and the battery charge barely made it through vacuuming one car. Does a good job with dirt piles after sweeping the tile and hard-wood...not enough oomph for dust or dirt on carpet. Decent hand vacuum. Has good power for a hand vacuum. Medium weight. Certainly has enough power to clean up the types of messes that I would clean up with a hand vacuum. Not disappointed with the purchase. Would buy again. It's powerful and it's light weight. Easy to clean and easy to charge. Perfect! works great. charge starting to work on shorter cycle. Seems to work only 10 min or so then needs another charge. overall well worth the $$. Not very powerful. About why you would expect for the money. Is it possible to give ZERO stars?? Piece...of...GARBAGE!!!! Barely holds a charge long enough to get hair off the bathroom floor!!! Ok for the price - suction is average. Extender is fine, but shouldn't take two-4 min to determine it is to slide in two lock. Should lock automatically and unlock as well. This is a good little vacuum if you have hard substances that you need to get up. It does not work well with pet hair. There is a filter inside that is impossible to get completely clean and grosses me out eveytime I have to knock all the pet hair off of it. I would have preferred a bagless handheld without a filter. "what is all included with this." Hello, jamesg111. This includes the vacuum and a quick-flip crevice tool. Thank you for shopping with us! "what is the capacity (amount of dirt held before full)?"